The following paper includes findings from a national survey of US charitable donors that was conducted the week after the earthquake in Haiti occurred and during intense fundraising efforts for emergency relief. This data indicates that mobile philanthropy, while not universally accepted is gaining traction with younger generations, and the text-to-gift efforts around Haiti could be the tipping point for greater adoption. Copyright Convio, Inc. All rights reserved. Convio, the Convio logo, TeamRaiser, Constituent360, Go! and Common Ground are trademarks or registered trademarks of Convio, Inc. All other names are trademarks or registered trademarks of their respective owners. 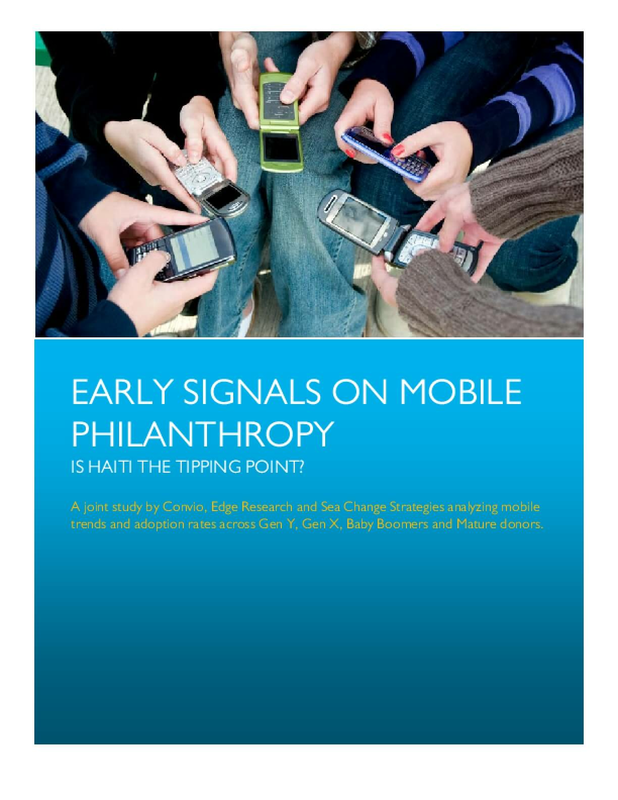 Title: Early Signals on Mobile Philanthropy: Is Haiti the Tipping Point?